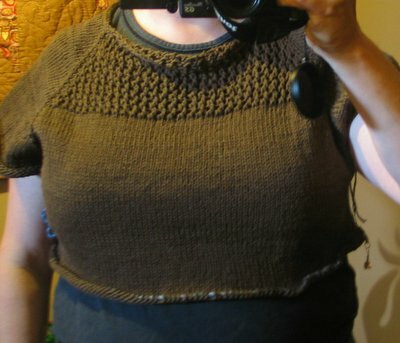 Green Gable Knit Along: Help please! I am making the XL because of my bust size, but fear I should have made the L. It isn't too big and a little hard to tell as the sleeves are not done. Should I have gone down for the negative ease? I was hoping to frog possibly a few rows then do some decreases. Don't think I could handle frogging this again! Thoughts...suggestions..hints... help!! my first gable was too large too. i started with the largest size, but ended up casting on for TWO sizes smaller - the Cotton Fleece had a lot of stretch to it, so this smaller size resulted in a nice fit. i think it depends a lot on the yarn you're using. could you shrink it up a bit? (i had to throw my first gable in the dryer for bit!) would decreasing more frequently after the bust area make it fit better? I am wondering that too! I really think I am going to frog a few rows and start decreasing and see how it goes. I wonder if it would hurt to do the sleeves now before I finish the body. I would stop where you're at and start over. I, too, knit one that was a tad too large. (I used Cotton Fleece.) It grew when washed, so I had to toss it in the dryer. It did tighten up a lot, but it also fuzzed and shed like mad. I spent an hour with the sweater stone last week. (Both times it has been washed it grew again.) From the looks of it, even if you decrease, the neckline may be too big. GOOD LUCK! I have yet to start mine but was wondering (If you don't mind my asking) what your bust size is? I'm a 38DD and was wonderign what size I should make. I hate to tell you to undo all your hard work, but if you want it fitted then I do think you should make the smaller size. Mine is too big and I'm really unhappy with it. I frogged mine halfway through as well. I wish I'd ripped it out again halfway through the second time and made it smaller still because I'm thinking I'm never going to wear it. But then, I want it be fitted. Some people seem to like it loose, I'm just not one of them. If you're happy enough with the neckline, you might just want to go back up to the CD section and remove the extra round for the 38 and continue down with instructions for the medium from there. That will keep the extra rounds in the lace but eliminate the extra rounds in the stockinette - which is where I think the size 38 starts to go weird (at least for me). Then try it on again and figure out exactly where you want the decrease to start on your body. Can you sew the sleeves with a basting stitch and retry it on?- It doesn't look that big to me from the picture.